We all know very well that Clearing the recycle bin, in the tech giant Microsoft’s well-known and most used operating system, of course, Windows 10, is as simple as in the rest of the versions of Windows. And to do so we simply have to do right click on the recycle bin icon, on the desktop and click on the specific command for it. But, we all know that it is a manual procedure, hence, today here we will show you all something different. As there is a way to configure the Windows operating system, so that the recycle bin could get cleared, automatically, every time we turn off the computer. Clearing the recycle bin, in the tech giant Microsoft’s well-known and most used operating system, of course, Windows 10, is as simple as in the rest of the versions of Windows. And to do so we simply have to do right click on the recycle bin icon, on the desktop and click on the specific command for it. However, we all know that it is a manual procedure, hence, today here we will show you all something different. As there is a way to configure the Windows operating system, so that the recycle bin could get cleared, automatically, every time we turn off the computer. This way we can avoid ‘leaving traces’ when using the computer, and of course, we will avoid occupying unnecessary storage space of the system. Also Read: What Is The Difference Between Sleep Mode And Hibernate? By default, in computers with Windows 10 operating system, and in previous versions, the task of emptying the recycle bin has to be executed manually. But luckily for users, there is a way to automate the whole process. So, as we said, we can choose that the computer itself could simply clean the files as soon as we turn off the computer. But keep in mind that, for this automation, we have to have the tech giant Microsoft’s Windows 10 Pro, as we are going to modify settings that are only available in this version, slightly more complete than the rest. First of all, go to the desktop, create a new text document and, in it, paste the following command: PowerShell.exe -NoProfile -Command Clear-RecycleBin -Confirm:$false. Once you are done the above step, now simply save the file and exit it. Now simply edit the extension that will be left as “.txt” and replace it with “.bat”, in such a way that it remains as ‘Empty Recycle Bin script.bat’, for example. After the above step now you have to put some file in the trash and double click on the newly created file. If the script has been created and executed correctly everything will go well and the double-click will simply empty the recycle bin. Now you have to make it run automatically when you turn off the PC. In the search bar of the tech giant Microsoft’s Windows 10 simply type ‘gpedit.msc’. After that now simply click on run, then scroll to Computer Configuration > Windows Settings > Scripts > Shutdown. 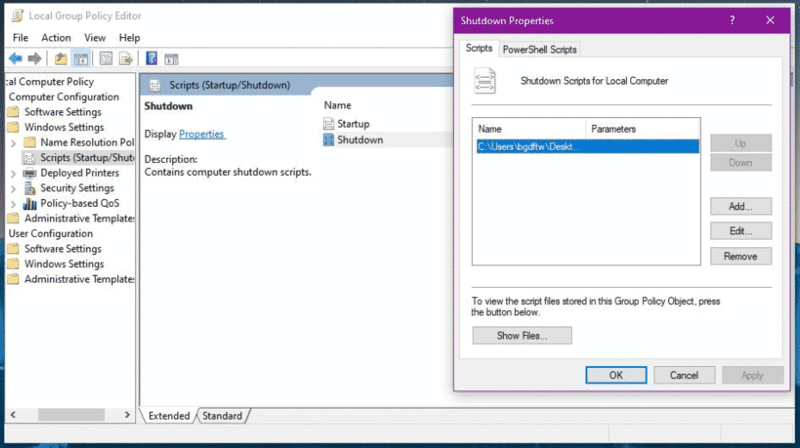 Now, after executing the above step successfully, in the Shutdown screen simply click Add > Browse and provide the location of the script that you have created earlier. 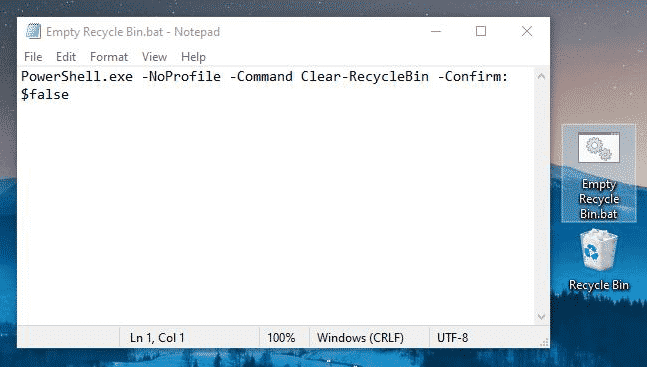 Now after successfully executing the above steps now the script will run automatically when you turn off the computer or PC, and the recycle bin will be automatically cleaned. So, what do you think about this? Simply share all your views and thoughts in the comment section below. And if you liked this article then simply do not forget to share this article with your friends and family.